"I cried happy tears when I received your generous gifts. I appreciate it so much at this trying time in my life. I am forever grateful!" "For me, these days (Spa Weekend Retreat) are special because it is so uplifting to get the love and support from the wonderful ladies. I was down. Now I'm way up!" "Thanks for the opportunity for this wonderful weekend (Spa Weekend Retreat). It was filled with love, energy and happiness!" "The retreat gives me such hope. 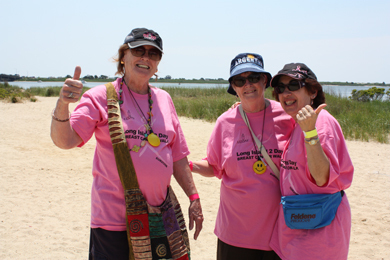 Seeing survivors each year healthy and happy is an inspiration to those who were recently diagnosed."